Fire up the grill this summer and don’t forget to add your veggies. 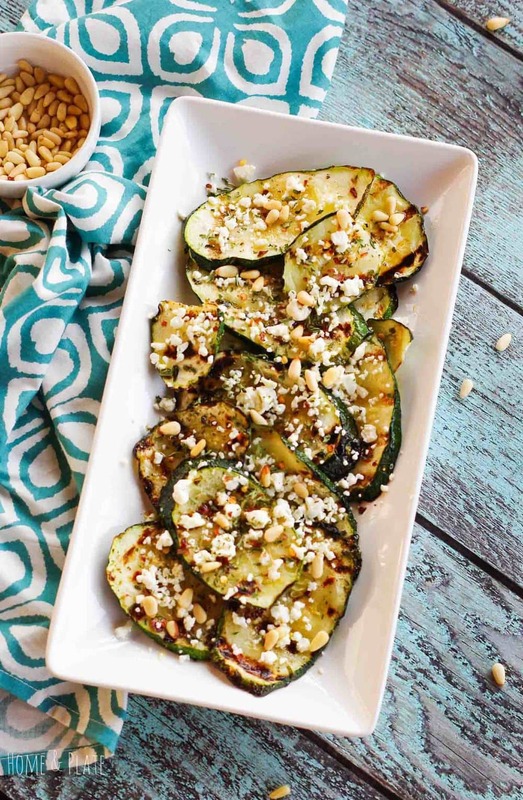 This recipe of grilled zucchini with feta and pine nuts makes grilling out easy. I love a meal where everything can be prepared on the grill. This is a perfect side dish for any grilled meat, chicken or fish. The prep work takes five minutes and the result is a grilled tender vegetable side dish that’s full of flavor. Toss your veggies in a little olive oil with herbs and grill them to perfection. Any opportunity to do my cooking outdoors and I’m all over it. Turn that oven off in the summer! 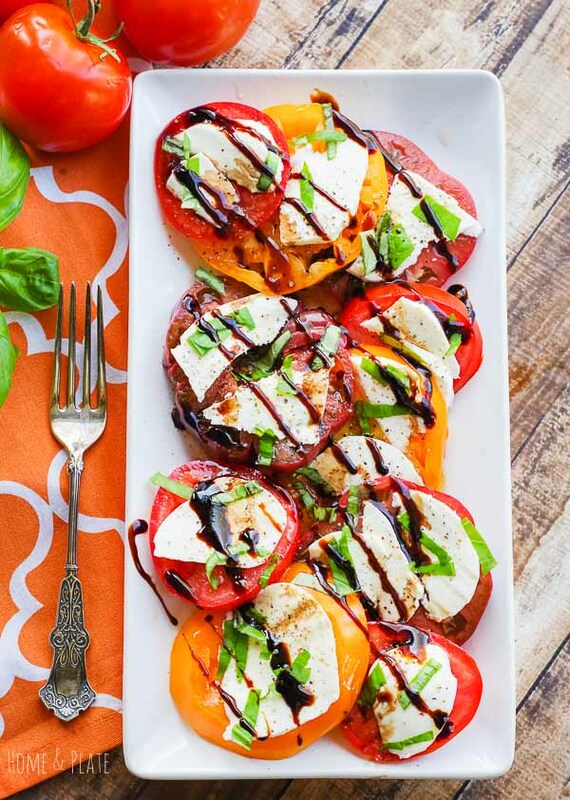 One of my favorite summer recipes is grilled eggplant seasoned and served with a fresh tomato and mozzarella caprese. 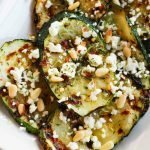 I prepare this zucchini recipe in the same way as I do the eggplant but instead of fresh caprese, I substitute in salty feta cheese and toasted pine nuts. It’s a winning summer dish that is light yet healthy. Zucchini is such an easy vegetable to grow in the garden if you have the room. Garden zucchini can get enormous and for this recipe that’s what you want. If you’re at the grocery store be sure to pick out a zucchini that’s fat. You’ll be cutting it on the diagonal because you want thick slices for the grill that won’t fall through the grates. It’s simply a matter of brushing a little olive oil onto your zucchini, adding some herbs and heat from red pepper flakes and grilling it to perfection. It doesn’t get any easier than that. A sprinkle of salty feta cheese adds a creaminess to the zucchini that is undeniable. The crunch from the pine nuts makes this side irresistible. I promise the plate will be empty by the end of the meal. I got into a rut preparing grilled zucchini the same old way – in a foil packet with a drizzle of oil and a sprinkle of salt. I got the inspiration for this recipe after paging through a food magazine at the orthodontist, although I can’t remember which one. I decided to prep the zucchini the same way I do my grilled eggplant. It was simply a matter of adding feta and pine nuts instead of tomatoes. This would also be delicious with goat cheese if feta is not your thing. It doesn’t get much easier than that. I think squash would also be delicious prepared in the same manner. I definitely need to find more ways to eat zucchini. It’s so yummy and best during the summer growing season. Fire up the grill this summer and don't forget to add your veggies. 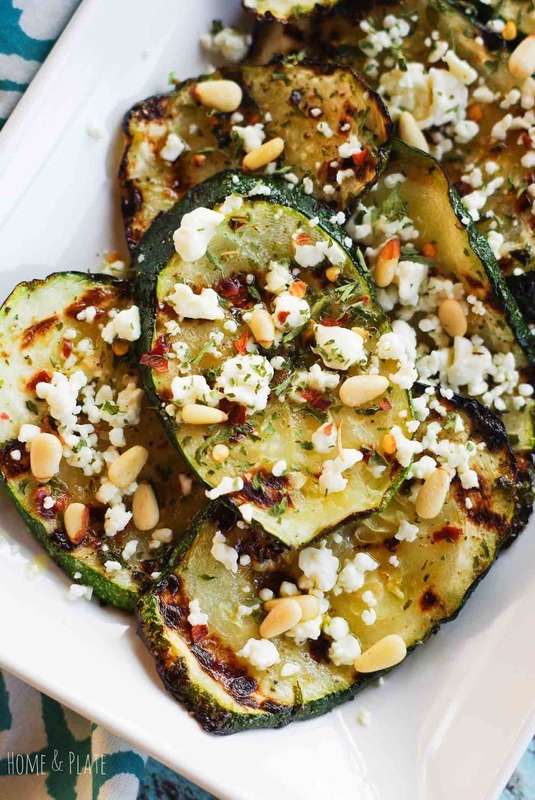 This recipe of grilled zucchini with feta and pine nuts makes grilling out easy. Slice the zucchini at an angle about 1/4 inch thick. Brush each side with olive oil and arrange the slices on a plate. Season with the zucchini with red pepper flakes, garlic, oregano and parsley. Preheat the grill to medium heat. Grill the zucchini slices for about 2 to 3 minutes per side until see grill marks. 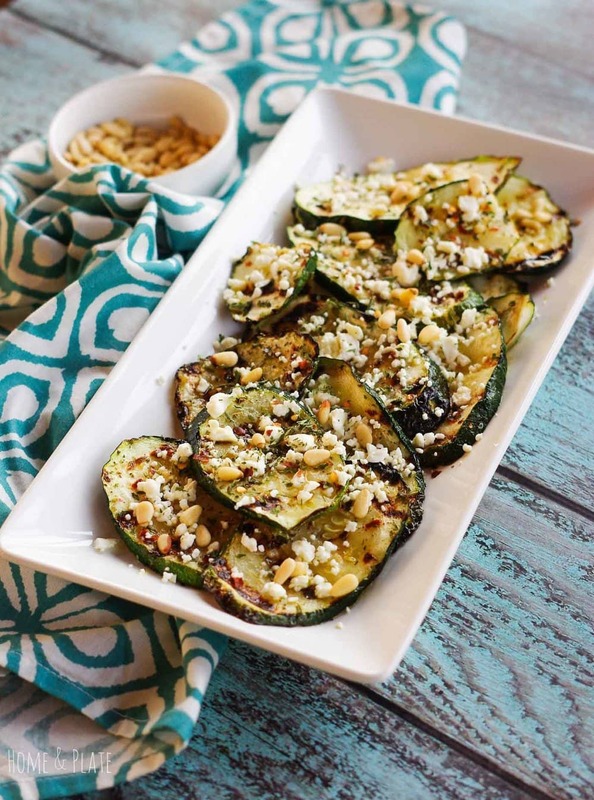 Arrange the grilled slices on a platter and top with the feta cheese and pine nuts. I love meals done on the grill too! This looks wonderful! I think I’d probably eat the whole batch! 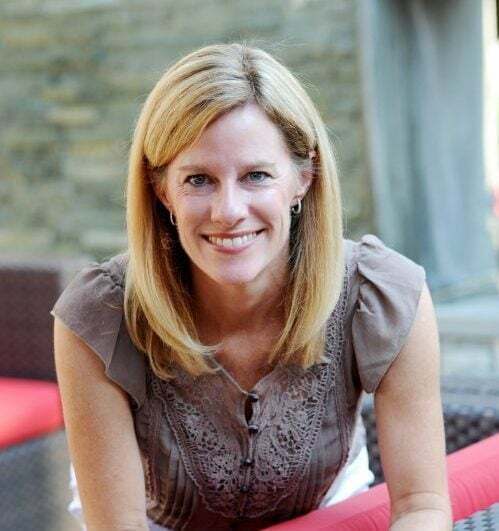 Thanks Annie….make plenty because it goes quickly. This is my kind of dish! I’d have to add a drizzle of balsamic glaze, then I’d make a meal of this and forget everything else. I’m glad I’m not the only one hunting for recipe ideas at the doctor’s office! This is an awesome way to snazz up grilled zucchini, great job! OMG – these look perfectly cooked! I love the addition of feta to veggies, it adds a gorgeous salty flavor. I love this! I have a plethora of zucchini on the way and am always looking for new ways to serve them Thank Ali!